This recipe might be the greatest thing I’ve ever invented. 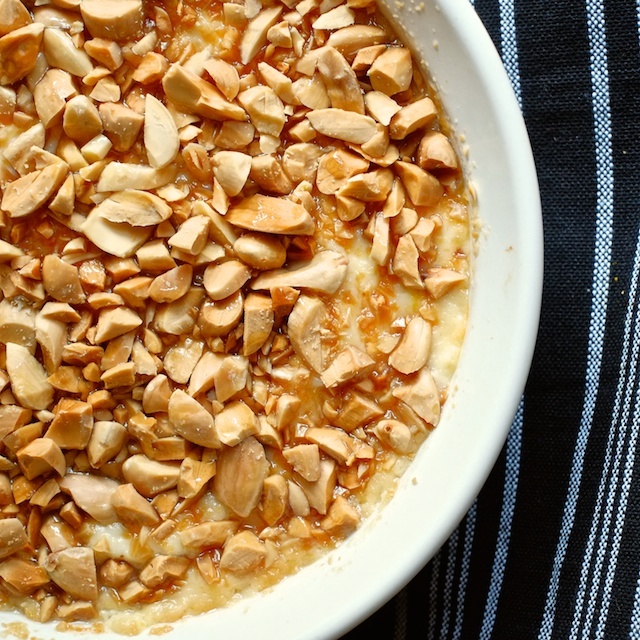 It’s rich and creamy, and sweet enough to be a dessert without being cloyingly so. 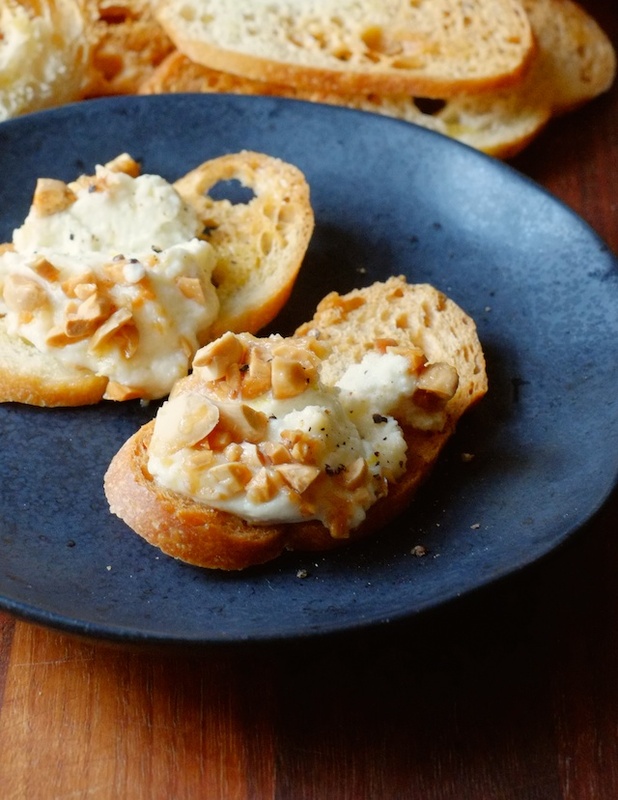 The goat cheese keeps it interesting (trust me, it goes really well with sweet things), and the lemon zest cuts through all the richness in the best way. It’s just really good. 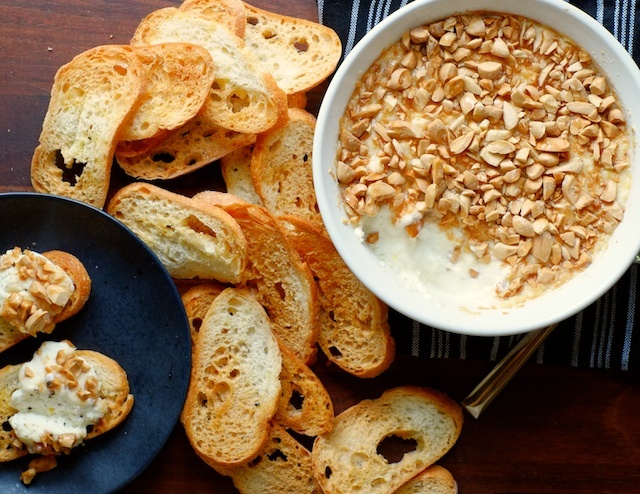 Baked ricotta is one of those dips that you don’t see very often, but it’s so delicious it really needs to make a comeback. 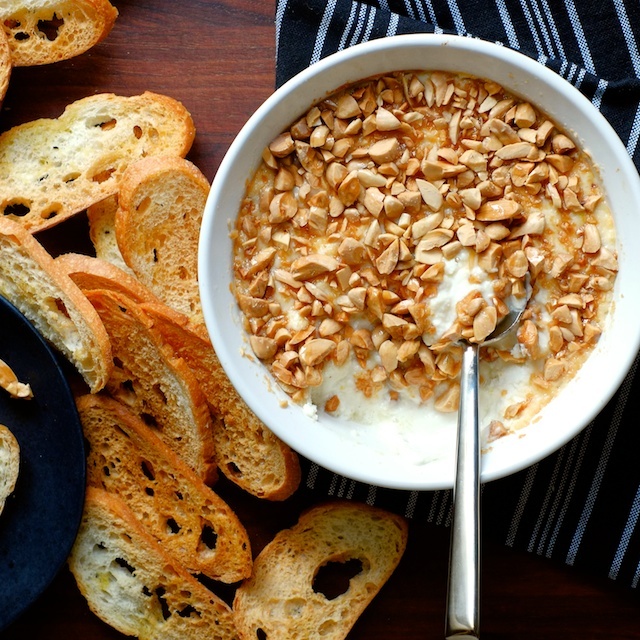 I used some of my fancy naked roasted almonds to top off this dip, but if you aren’t into peeling your own almonds (I get it), you can definitely use regular roasted, salted almonds. There she is, above, ready to go into the oven. And below, the finished, golden-brown and delicious product. 1. Put your ricotta into a strainer over a bowl, cover with paper towels and another, heavy-ish bowl (just to speed the process a bit). Allow the ricotta to drain for about an hour. (This step isn’t utterly mandatory, but ricotta will let off some water when it’s warm, so the more you strain it, the less liquid you will have in your dip). 2. Preheat your oven to 375. 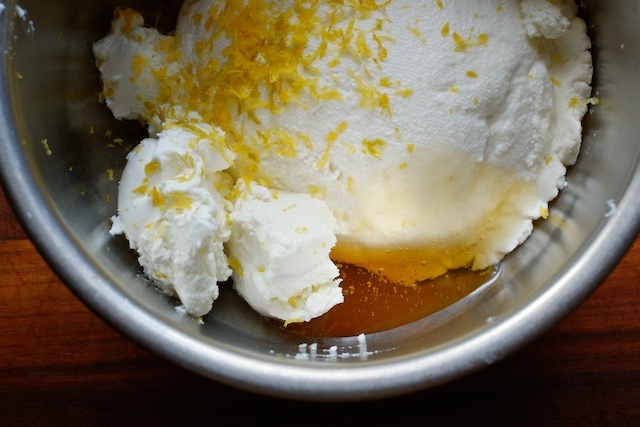 Dump the drained ricotta into a mixing bowl, add goat cheese, honey, lemon zest, lemon juice, and a pinch of salt. Mix well and taste. Make any adjustments you deem necessary, keeping in mind that you are about to add more honey on top. 3. Transfer your ricotta mixture to a small baking dish and smooth out the top with a spatula. 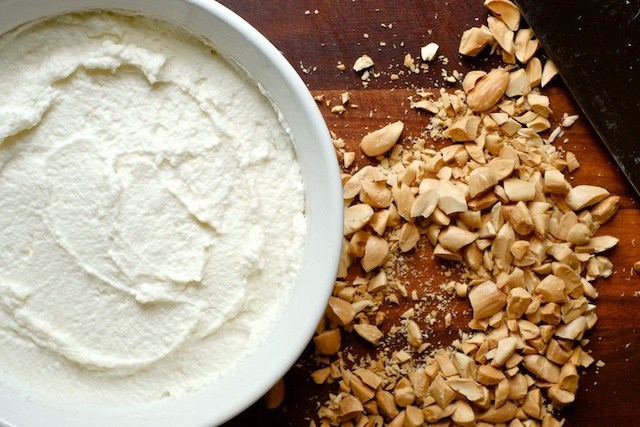 Chop up your roasted, salted almonds and cover the ricotta with them. 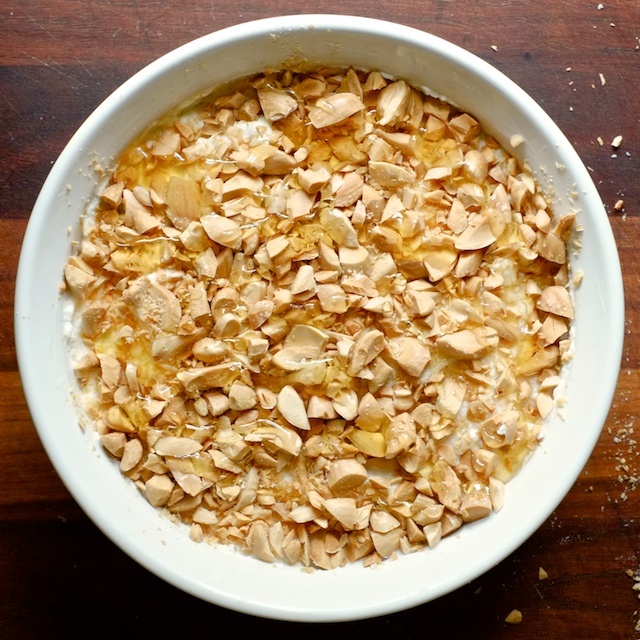 Drizzle the almonds with honey. 4. Bake your dip at 375 for 20-25 minutes, or until the top is slightly browned around the edges. When you take it out of the oven, it will be a little wobbly-looking. Let it cool for about 20 minutes, and serve with crostini and maybe a little grind of black pepper (trust me it works). P.S. It’s also good cold. Hey Marcia! Thanks for reaching out. I'll send you an email as soon as I get to my computer!